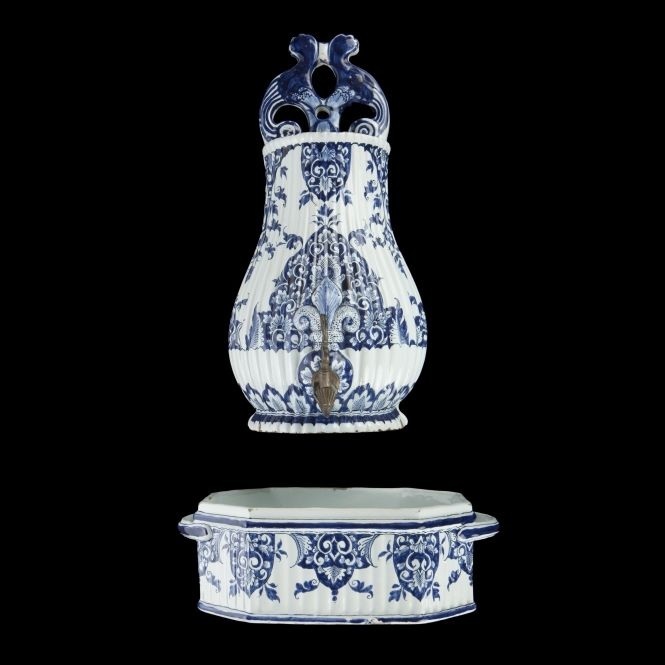 Blue and white faïence simulated the translucent appearance of porcelain imported from Asia. The 1701 inventory of René-Louis Chartier de Lotbinière, a seigneur and Chief Councillor of the Sovereign Council of New France, makes explicit reference to this with an earthenware service comprising six platters, fourteen plates, and eleven jelly cups in the "façon de pourcellenne," or in the manner of porcelain. A Delft plate at right, owned by the Augustinian Order of Québec, bears witness to this fashion for chinoiserie in New France as well as the presence of non-French ceramic types in the colonies. Although it provided a less expensive alternative to authentic porcelain, faïence is prone to chipping. Porous earthenwares fired with silica glazes were produced throughout Europe in the early modern period. In France, ceramics craftsmen imitated forms and techniques associated with the Italian town of Faenza, producing faïence. The addition of tin oxide to the glaze gives faïence an opaque, white ground upon which different color decoration can be painted. Blue was an especially popular color. Ceramics from around the Dutch town of Delft are perhaps the most familiar type of tin-glazed earthenwares. In England, comparable products were marketed as "delftware," with Iberian and Italian potters producing majolica. By the eighteenth century, French centers of faïence production included the towns of Moustiers in Provence, Nevers in Burgundy, and Rouen in Normandy. Although not technically faïence, earthenwares fired with glazes containing lead and other oxides are often referred to as faïence ​in French sources. ​The eighteenth-century Rouen faïence plate at right is representative of the sort of plates found in the better sort of French colonial homes. The household of wealthy Québec merchant Denis Riverin and his wife Josephte Perthuis boasted three-dozen faïence plates in 1756. These were inventoried alongside various faïence vessels in the salle. Three-dozen faïence plates were sold in lots of a dozen from the estate of Geneviève Marchand, the widow Marcoux, alongside ten other faïence plates, eight platters, a basin, a pot, and two chamberpots in 1756. 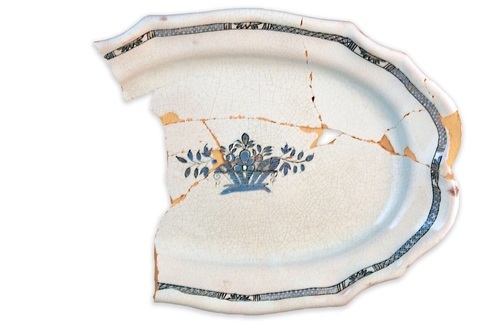 ​​With its traditional blue and white palette, the faïence platter above and a more colorful serving vessel, possibly a saladier or salad bowl, at right were recovered from the latrine of the Perthuis House on Place Royale, in Québec City. Built in 1682, this structure was home to the merchant Charles Perthuis and his son Joseph, a member of the Superior Council, before its destruction in 1759. The site has yielded a significant amount of archaeological material including ceramics, glass, and metal objects from the French colonial period, several of which are featured in the following sections. A plate at left was excavated on Cape Breton Island in Nova Scotia and shows how Asian styles were subsequently modified by European ceramics craftsmen. Made in Rouen in the early eighteenth century, its blue and white décor is reminiscent of the Delft plate owned by the Augustinian Order. However, its stylized border is inspired by contemporary French baroque and early rococo design. At the center are the arms of Joseph de Monbeton de Brouillan, better known as Saint-Ovide. A military officer, Saint-Ovide assumed the governorship of the colony of Ile Royale from 1717 to 1739. It presumably formed part of a larger service and undoubtedly found a place of honor at dinners hosted in the governor's apartments in the king's bastion at Louisbourg. Similar plates with and without armorial devices have been found at other sites. 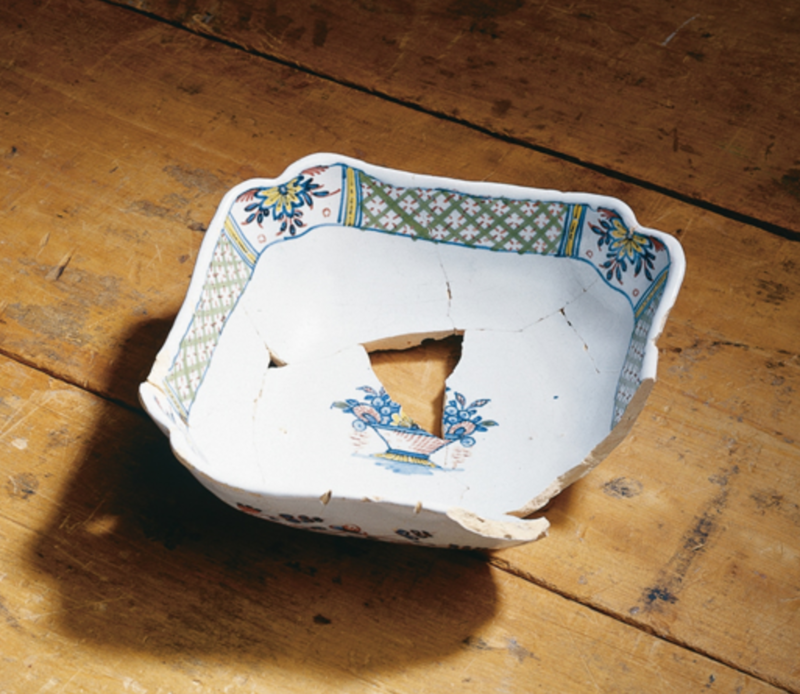 ​Seen around the rim or edge of the plate above, the chipping and flaking is characteristic of faïence's durability. Sherds excavated archaeologically attest to this materiality, with an abundance of French, Dutch, English, and Iberian earthenwares having been recovered from French colonial sites including Québec City, Montréal, Louisbourg, and New Orleans. ​In contrast to the above example from Rouen, the platter at left was produced in Moustiers. It was also found in a latrine, in this case at the site of the Estèbe House, completed in the early 1750s. Its characteristically exuberant design includes the use of bright colors to delineate playful chinoiserie figures and a dragon as well as delicate floral motifs and insects. Other serving and dining wares were made of faïence. The covered jug or burette above was probably made in the faïence center of Moustiers. Like the Rouen platter, it was discovered at the site of the Perthuis House in the rue Notre-Dame of Québec's Lower Town. The white faïence chocolate pot (chocolatière) or coffeepot (cafetière) at right was excavated from the same site. Other utilitarian serving objects such as mustard pots (moutardiers), sugar casters (saupoudreuses), wine coolers (rafraîchissoirs or bassins à rafraîchir), soup tureens (soupières), salt cellars (salières), and castor sets for oil and vinegar (portes huiliers vinaigriers) might also be made of faïence. The object below, an eighteenth-century Rouen faïence fontaine, or fountain, could have been installed in a public room in an elite house. Such water fountains were ordinarily affixed to walls, and a decorative model like this one would not have been out of place in a public salle. Guests or family members would use it to wash their hands before a meal. Fragments of similar objects have been recovered archaeologically in Canada. 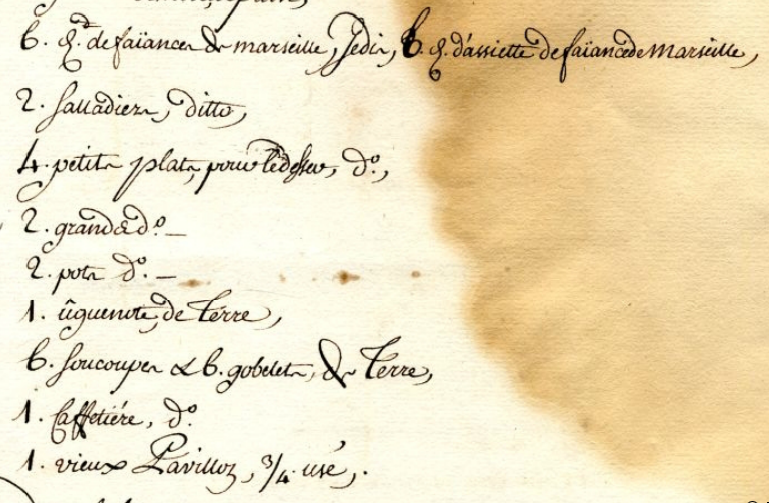 The 1748 inventory of Jean-Baptiste Léonard Hervieux, a merchant from Montréal, records "une fontaine de fayance avec sa cuvette," the cuvette being the basin into which water would flow. Jean Latour, another Montréal merchant, owned a faïence fountain and basin as well as six plates in 1749. The galerie of admiralty prosecutor Jean Cambon's home in Saint-Pierre, Martinique was outfitted with a faïence fountain in 1766; this breezy space, a concession to Caribbean heat, contained two tables, one of which was described as a table à manger. Although true porcelain drinking wares were the most prized, faïence provided a more affordable substitute and reproduced both designs and forms used in porcelain. The small cup or bowl at right is similar to those documented in colonial inventories and could have been used for drinking coffee, tea, and chocolate. In addition to its simple blue and white décor, the bowl's form and lack of handles are directly inspired by Asian porcelain prototypes. Inventories and successions often list cups and saucers in sets of six, as seen in that of Bertrand Larreguy of Québec from 1737 and merchant Jean-Baptiste Léonard Hervieux of Montréal in 1747. 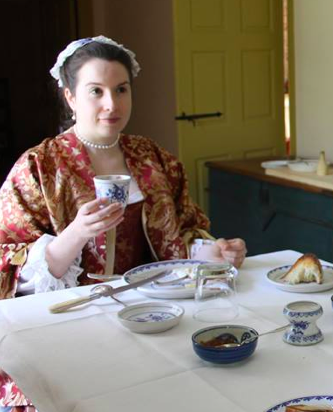 Jean-Charles de Pradel, a Louisiana soldier-turned-planter, died in 1764 with a set of fifteen faïence coffee cups and saucers as well as a teapot in his impressive stock of serving and drinking wares. Jean-Jacques Blaise d'Abbadie, the director-general of Louisiana responsible for overseeing the colony's transfer to Spain, owned twenty-four faïence coffee cups and saucers upon his demise in New Orleans in 1765. François Goudeau, the king's surgeon in New Orleans, owned six faïence coffee cups and saucers when his estate was appraised in 1759. He also owned another set of six coffee cups and saucers, two coffee pots, a tea pot, and another pot of glazed black earthenware, possibly faïence, with gilding. Black earthenwares with a black glaze and gilding were produced in Namur, in present-day Belgium. Similar ceramics were produced in Britain at the Jackfield Pottery in Shropshire; it is entirely possible that Jackfield wares were traded and arrived in New Orleans. Goudeau's property was inventoried after news of his death in a British jail reached New Orleans in January of 1759. Two-dozen faïence coffee and tea cups could be found in the home of Étienne-Martin de Vaugine de Nuisement, a former French military officer whose indigo plantation on Bayou Teche was inventoried in 1773. Tin-glazed earthenwares from other European countries also made their way to New France. 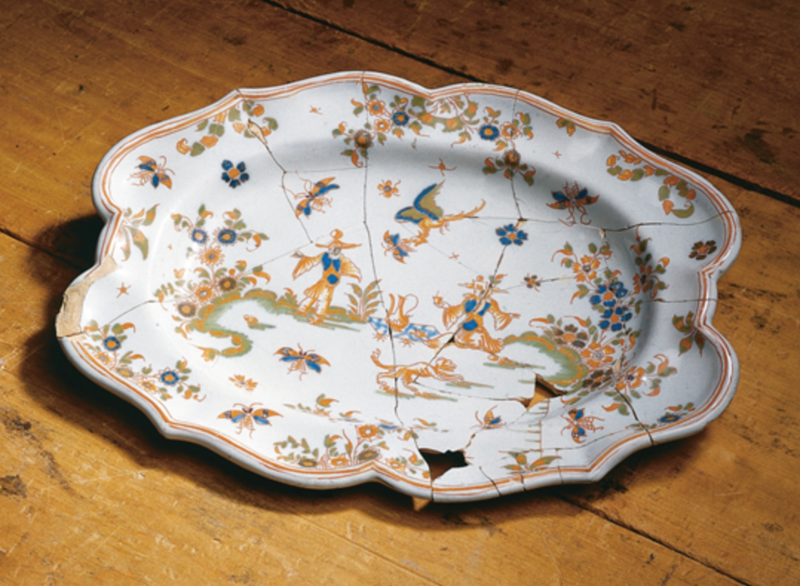 Excavated from the privy of the Leber House on Québec's Place-Royale, a colorful faïence basin with a stylized floral design at right was made in Muel, Spain, in the late seventeenth or eighteenth centuries. The blue and white cup and saucer below, from the neighboring Perthuis House, were made in Delft in the first half of the eighteenth century. ​English tin-glazed earthenware or delftware has also been uncovered at domestic sites in New France. The English delftware plate at left was also excavated at a home in Québec's Lower Town near the Place-Royale. Its style and color suggest production in Lambeth, now a borough of London. The 1732 succession of Québec merchant Jacques Bondy also describes a garniture in the chambre, this time set on the mantelpiece. Composed of twenty pieces, "large and small," Bondy's "garniture de cheminée" must have been especially impressive. It was likely reflected in one of the three mirrors hung in the room, one of which occupied the space over the mantel or between two windows. In addition to utilitarian drinking and serving wares, decorative objects in French colonial homes might be made of faïence. Inventories and successions describe several households with mantelpieces and case furniture embellished with decorative assemblages or garnitures of ceramic, metal, and hardstone vessels. The 1724 estate settlement of Louise Guillot, the widow of bourgeois merchant Pierre Haimard, recorded a seven-piece garniture of "faillance ordinaire" set atop an armoire containing her linens. 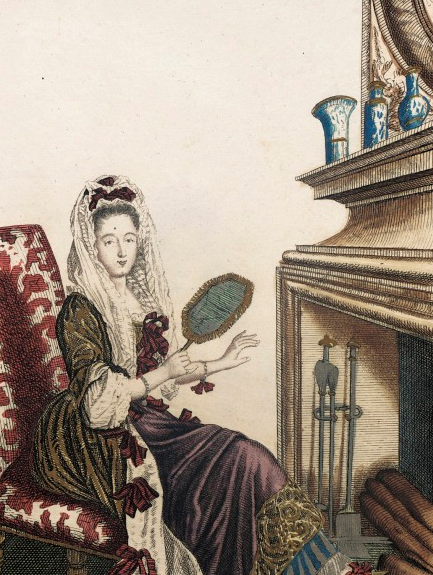 Set in the chambre of her home in Québec, Madame Haimard's ownership of a garniture connected her to European fashions of the late seventeenth and early eighteenth centuries that her colonial peers sought to recreate. Also inventoried in 1724, the Montréal home of François Marie Bouat his wife Madeleine Lambert Dumont boasted two garnitures in the chambre, one composed of nine marble vases with tin ornaments and another of seven faïence vessels including two cups. Assemblages of ceramics including porcelain and tin-glazed earthenware along with glass on mantelpieces, above doors, and atop case furniture were especially in vogue thanks to the publication of designs by the French Huguenot Daniel Marot. Forced into exile after the revocation of the Edict of Nantes, Marot found refuge in the Low Countries before journeying to England under the protection and patronage of William III and Mary II. Among his designs for interiors were rows of brackets and matching tables and stands, often set on either side of fireplaces. These were in turn used for the display luxury items, specifically vases, saucers, and other vessels. French designer Nicolas Pineau also published models for decorative brackets in the 1720s and 1730s, noting how ceramics might be set on them for ornamental display. ​Lucien Bouteville, a bourgeois merchant of Québec, owned a number of a faïence wares. 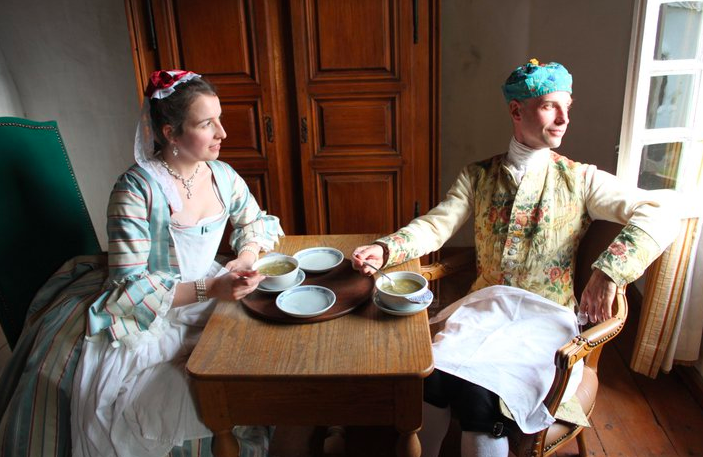 His home was inventoried after the death of his widow, Charlotte de Clérambourg, in 1713, and included a faïence chamber pot along with a bénitier, or small holy water font. More utilitarian in nature than the bénitier but not lacking in ornament, the chamberpot at left was recovered from the Perthuis House latine. 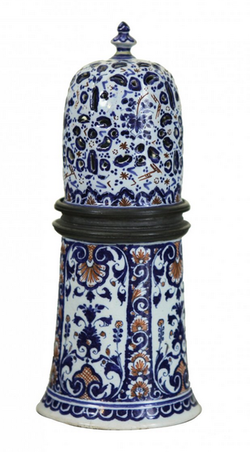 It was probably made in the northern French city of Rouen on the basis of its decoration. François Martel de Brouague was a noble merchant and ship-owner born in Québec in 1692. A large part of his fortune lay in his position as commandant of Labrador, a post inherited from his stepfather in 1717. Charged with defending French fisheries and fur trading enterprises in Labrador, he made lucrative profits off of North Atlantic cod as well as commercial seal hunting. In Labrador, Martel de Brouague established himself as a sort of local governor and merchant. His multi-room house at the post of Phélypeaux overlooked Bradore- then known as Phélypeaux- Bay across from British-held Newfoundland. Before leaving Phélypeaux in 1740, Martel de Brouague drew up an inventory of his personal effects, including faïence. Described as Marseille faïence, twelve plates, two salad bowls, and six platters of varying sizes were among the objects enumerated in his list. A castor set and a salt cellar of unidentified faïence were also described, as were a set of six earthenware cups and saucers and a coffeepot. Boasting tapestry wallhangings, silver, and porcelain, Martel de Brouague's house at Phélypeaux was undoubtedly the grandest domestic site in this northernmost area of French colonial settlement. By the mid-1740s, Martel de Brouague, his nobly-born Canadian wife Louise-Madeleine Mariauchaud d'Esgly, and their daughters Louise, Madeleine, Catherine, Angélique, Marie-Charles, and Marguerite were living in Québec; the daughters were being educated at the Ursuline convent. Beginning in 1746, they lived in the southern wing of a house built by the bourgeois-turned nobleman Charles Aubert de La Chesnaye. With its slate Mansard roof, this waterfront home was completed in 1679 and was one of the most prestigious addresses in the capital. Archaeological excavations reveal patterns of ceramics consumption, including faïence, at the site by the Martel de Brouague family in the 1740s and 1750s. During this period, French, Dutch, and even Chinese ceramics could be found among the family's collection of eating wares, as evidenced by pieces culled from a feature dating to the period of circa 1746 to 1760. The diversity of these artifacts is a testament to Martel de Brouague's wealth and commercial ventures in Canada, France, and beyond.